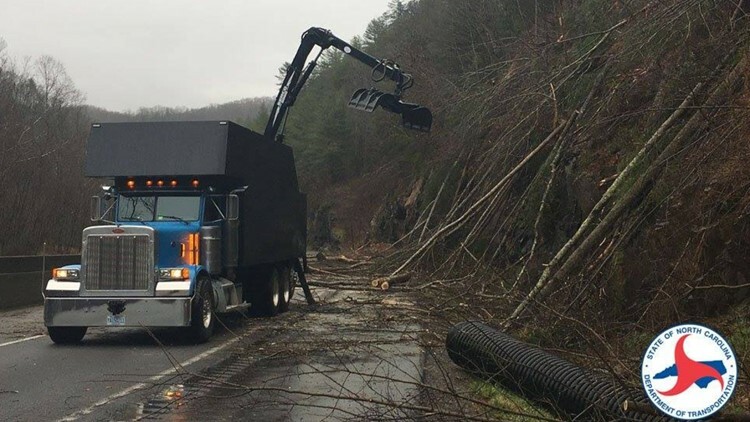 TDOT and NCDOT said a rockslide happened just a few miles south of the TN/NC state line Friday, blocking both lanes of I-40 in North Carolina. NEWPORT, Cocke County — I-40 near the Tennessee/North Carolina state line will be closed for at least a week after a rockslide Friday evening. A rockslide closed traffic on Interstate 40 in both directions between the Tennessee/North Carolina state line and Asheville, at the 7 and a half milemarker just beyond the Harmon Den exit. The slide was about 500 feet wide, according to NCDOT, Officials said it will take at least a week to get it safely cleaned up and stabilized. They expect that once the road reopens in a week, traffic will be down to one lane in each direction for six to eight weeks. TDOT said anyone heading east on I-40 toward Asheville will be turned around at the state line at Exit 451 (non-local traffic is being told to turn around sooner at Exit 435/Newport). NCDOT is turning drivers around at Exit 20 at the Highway 276 interchange west of Asheville. NCDOT said a contractor has started removing debris, scraping away lose rocks and trees on the cliff. “A series of wheelbarrow-sized rocks have come down. While our crews were clearing those out of the way, other rocks started coming down too," NCDOT maintenance engineer Wesley Grindstaff said Friday night. Until the interstate reopens, TDOT said travelers heading to N.C. should take I-81 North toward the Tri-Cities and then take I-26 East to Asheville. Officials are begging people to use the interstate detour, and not follow their GPS onto local roads like Highway 25/70. "Please do not take 25. The detour through Johnson City and Kingsport provides the accommodations that people need, should they have a mechanical failure, should they need food, should they need gas. Follow the signs, not your phone," said David Uchiyama, NCDOT Spokesperson. More than 26,000 cars normally come through this stretch of I-40 every day, and officials want that traffic on the interstates, not back roads. Rockslides have closed this section of I-40 many times in the past, sometimes for extended periods of time. In Oct. 2009, a massive rockslide closed the interstate for roughly 6 months. Prior to that, a July 1997 rockslide had also shut down the interstate for months.